G.Late Viking Era Sword 10-11c. 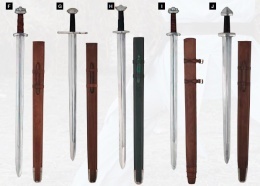 this classically style sword has two versions, regular and fighting (light combat ready) models. Its hand-forged EN 45 solid steel, with a single tang, fullered blade, leather wrapped hilt, traditional five lobe semi-circular pommel, thick square-section downward-pointing quillion, and includes steel tipped leather wrapped scabbard. Blade Length : 31", Blade Width. (Widest): 1.8", Overall Length : 38". This sword is available in two versions, regular and fighting (light combat ready) models. Hand-forged EN 45 solid steel, single tang, fullered blade, with a leather covered scabbard, affixed with a wooden suspension loop, and steel chape. Specifications are: Blade Length : 31", Blade Width. (Widest): 1.9" & Overall Length : 37.5". This Hersir Viking Sword features a triangular configured pommel. The shape of the lower guard seem to correspond to the Petersen reference as Type H, which appears to be have been found extensively in Norway, and as far south as Switzerland and Yugoslavia. The type H seems to have been in use about latter 8th c. to into the 10th. The pommel and upper guard of the Hersir are made in two parts, riveted togther, with a twisted wire between the the pommel and upper guard. Comes complete with wire wrap in pommel, light weight and well balanced sword. Made of EN45 steel, it features a single tang construction. Specifications are: Blade Length : 30", Blade Width. (Widest): 2.3" & Overall Length : 37.2". It's available in regular/ light combat(fight) versions. J.Hersir Viking Sword- late 8th c. into the 10th c.
This page was last modified on 16 June 2014, at 21:01.